Bush Family's Emails Hacked; Probe Under Way : The Two-Way A report in The Smoking Gun about the hacking has led to a criminal investigation. The hacker reportedly got hold of photos, cellphone numbers and home addresses. Also, some "sensitive correspondence." Former presidents George H.W. 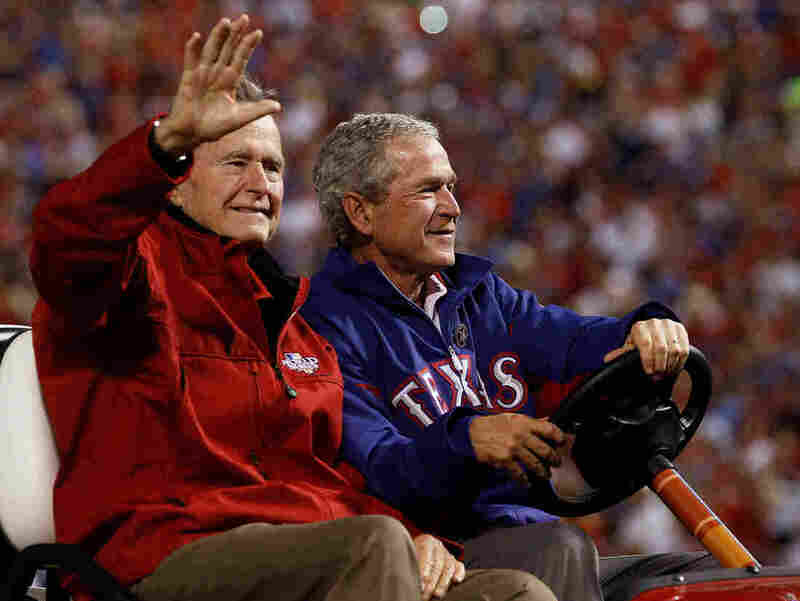 Bush (left) and George W. Bush at a 2010 World Series game in Arlington, Texas. A Smoking Gun report about the hacking of several email accounts belonging to members of presidents George W. and George H.W. Bush's family and some family friends has prompted a criminal investigation. The Houston Chronicle says that Bush family spokesman Jim McGrath confirmed an investigation is under way, but declined further comment. As Smoking Gun wrote, "the apparent hack of several email accounts has exposed personal photos and sensitive correspondence from members of the Bush family, including both former U.S. presidents." Smoking Gun says the hacker got hold of "home addresses, cell phone numbers, and e-mails for dozens of Bush family members, including both former presidents, their siblings, and their children." "The AOL account of Dorothy Bush Koch, daughter of George H.W. Bush and sister of George W. Bush. Other breached accounts belong to Willard Heminway, 79, an old friend of the 41st president who lives in Greenwich, Connecticut; CBS sportscaster Jim Nantz, a longtime Bush family friend; former first lady Barbara Bush's brother; and George H.W. Bush's sister-in-law." The Chronicle says the photos include "at least one taken of the elder Bush during his recent hospital stay in Houston." And, the hacker "also acquired photographs sent by former President George W. Bush to his sister. The photos were of paintings Bush had been working on, including self-portraits, [Smoking Gun] reported."